Nearly Easter! Once again this year, London's chocolatiers and pastry chefs have created some incredible recipes to meet your highest expectations. The traditional chocolate egg with a bow seems to have disappeared and making way for sardines, meringues, short breads and even chocolate flying geese... Chocolate is sculpted, flavours are harmonised, animals multiply and recipes proliferate. London artisans are about to mesmerise you with their chocolates, pralines, nougatines and sugared almonds... are you strong enough to resist temptation? For Easter, "Merveilleux" and "Incroyables" are turning into gourmet nests, garnished with small chocolate eggs... The perfect cake to be shared with all the family! Succomb to the temptation of miniature meringues and brighten the party up with "Magnifiques", "Impensables" and "Excentriques". Whether you prefer black chocolate, caramel or cherry flavour, there is something for everyone. 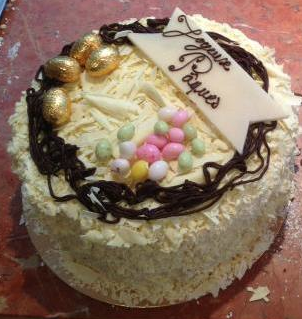 Our personal favourite: the "Incroyable", coated with speculoos whipped cream and white chocolate slivers. As soon as one enters the Aux Merveilleux shop in London, one is immediately overwhelmed by the trademark decor: pink marble, somptuous chandeliers and Bourgeois frescos telling history of the "Merveilleuses" and "Incroyables" during the French Revolution. Stop to admire the irresistible ballet of little meringues, covered with whipped cream and rolled in chocolate shavings and crystallised meringue. If you cannot resist, why not sit down and have one there and then with a tea or a coffee? This year, Jeff de Bruges surprise us once again with the diversity of their Easter treats. From the chocolate lollipop to the hamper via all sizes of hens, rabbits and ducks, everyone will find the perfect match! The little ones will probably fall for the adorable black, milk and white chocolate animals. We loved them. 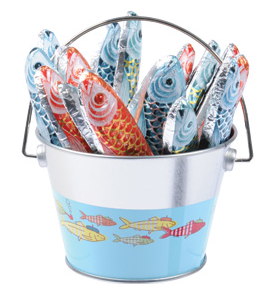 The most audacious will go fishing and will come back home with buckets full sardines. 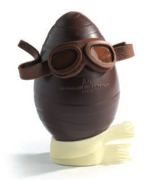 The most creative will prefer giving a personalised chocolate egg, on which they will write messages. Last but not least, those with the sweetest tooth will arrange their own sweet box or hamper, which they will fill with a multicoloured assortment of chocolate eggs and figurines. Jeff de Bruges are once again demonstrating their innovative creativity and aim to surprise with a multiplicity of funny, gourmet and unusual ideas. Since 1986, the French chocolatier Philippe Jambon, who now owns 500 boutiques worldwide, plays the hand of excellence and savoir-faire. His numerous recipes perfectly associate two complementary traditions of chocolate: the Belgian gourmandise and the French "cocoa chic". Your mouth is watering? Wait no longer: all those marvels are waiting for you on Thurloe Street. You might become speechless when looking at Nicolas Cloiseau's creations. 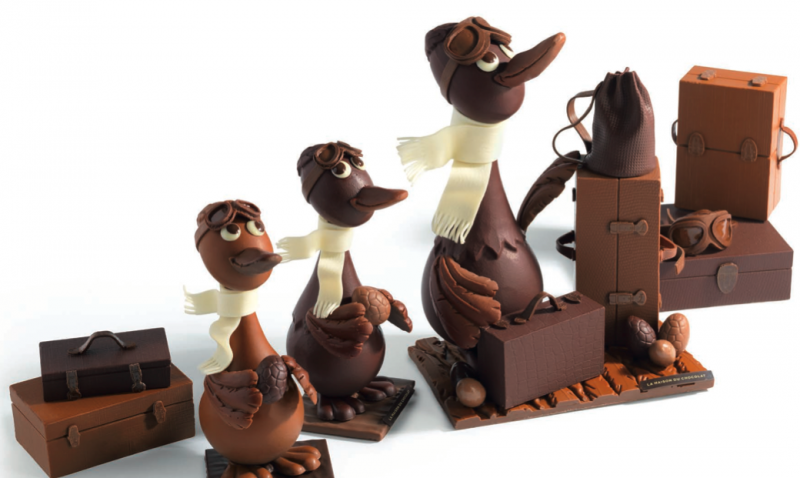 This chocolate master, who was awarded the prize of Best FrenchChocolate Artisan in 2007, is revisiting Easter and invites you for an "Easter halt" with aviator geese... The result is simply mind-blowing! Nicolas Cloiseau definitely enjoys perfection. His hand-crafted creations are impressively precise. This year, he decided to focus on the topics of travelling and aviation, and offers a range of tricolour chocolate eggs and geese. Seeing the motifs covering the suitcases and the cutting of the scarves, one could easily forget they are made of chocolate. 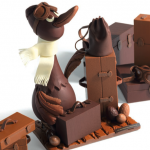 Please note that the chocolate characters and suitcases are filled with pralined crepes and small eggs, stuffed with hazelnut or almond praline. Such an experience comes at a price, but one cannot argue with the quality of the work achieved. And for smaller budhets, La Maison du Chocolat also offers a range of more traditional chocolates: boxes, assortments and chocolate characters. At Maison Blanc, traditional recipes meet unusual flavours. 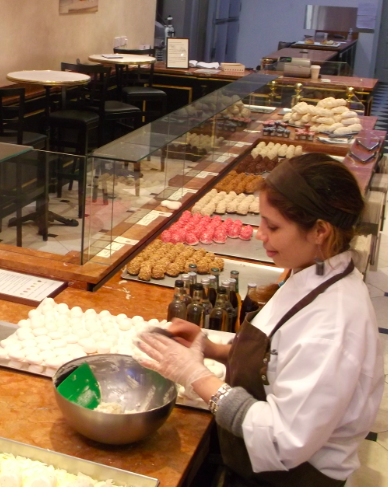 In the shop, you will be able to enjoy hot cross buns, carrot cakes and small bags of eggs, but also melon mousse or Matcha tea mousse cakes. Be prepared to surprise your senses. 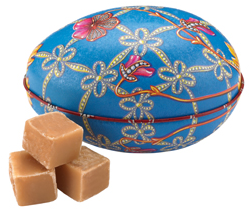 Maison Blanc is also revisiting great classics, such as the Fabergé egg, now filled with fudge. The whole family will love the large size Russian Charlotte and berry and chocolate pies, apart from the youngest, who might prefer the brooding hen or the adorable hatching chick. 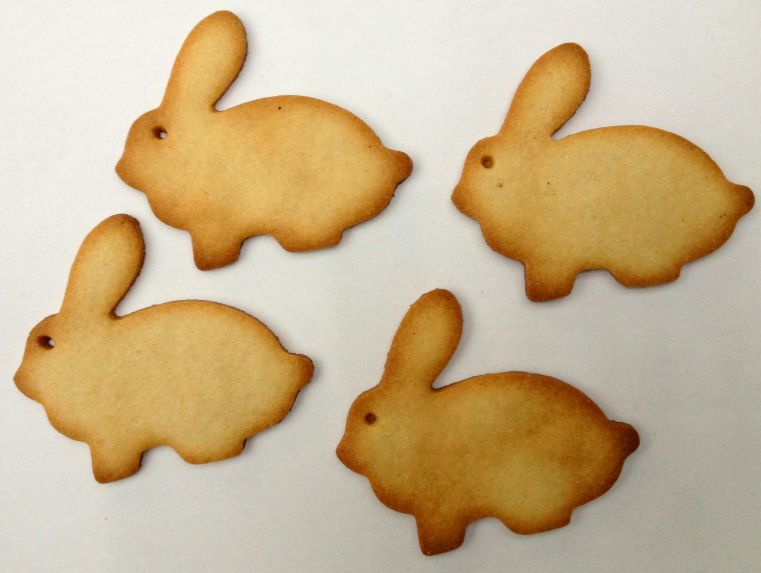 Poilâne, a family baker for almost a century, is offering rabbit-shaped shortbread biscuits for Easter. Chelsea - 39 Cadogan Gardens, SW3 2TB London - 020.3263.6019 - Open from Monday to Friday from 8am to 8:30pm and on Saturday and Sunday from 9am to 6:30pm. Belgravia - 46 Elizabeth Street, SW1W 9PA London - 020.7808.4910 - Open from Monday to Friday, from 7am to 7pm and on Sunday from 7am to 3:30pm.